It has been an exciting few days here. 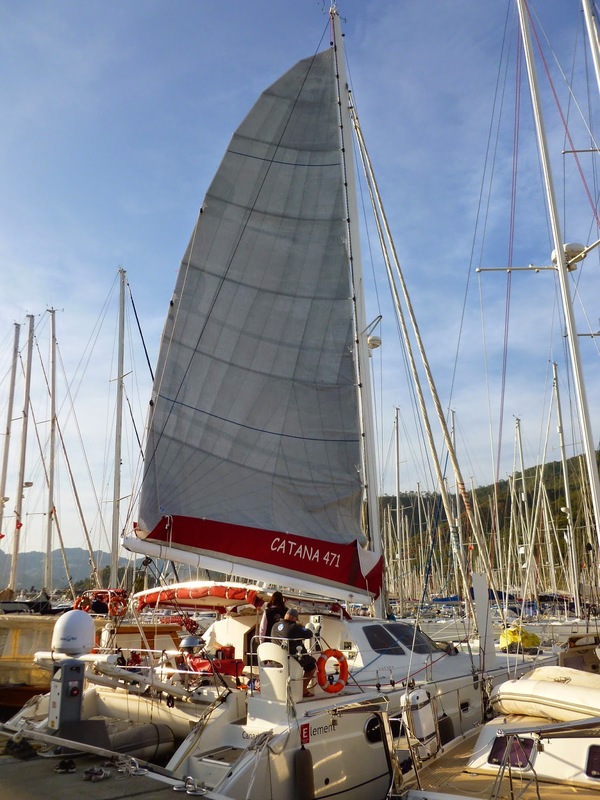 We had our sails put back on along with new running rigging (lines and halyards). It was very educational to watch North Sails re-run the lines and halyards. We learned some tricks for when we will have to do it ourselves. We had our new friends Lisa, Gary, Hannah & Quinn over for dinner. I was able to bake the meatballs in the oven. The kids were having a blast while waiting for dinner. I went into the Eczane (local pharmacy) to see if they carried my allergy nasal spray. To my excitement it was available for 15 TL which is equal to $7.50 CAD without a prescription. In Canada this used to cost me $35.00 plus the pharmacy fee. I was also sent up our 70' mast on a recon mission as other boats are having trouble hearing us when we transmit on our radio. I needed to take some pictures of how the antenna is mounted. Shaun, Jordan and I walked into town to pick up the rest of our boat graphics to be put on safety equipment. There is a local cat that lives near the washroom and he is soon lovey so the girls have named him Lovey. I would adopt him if I could. We were walking by the boat yard and to our delight we found these Turkish tuna.